UPDATE - This event has been canceled. 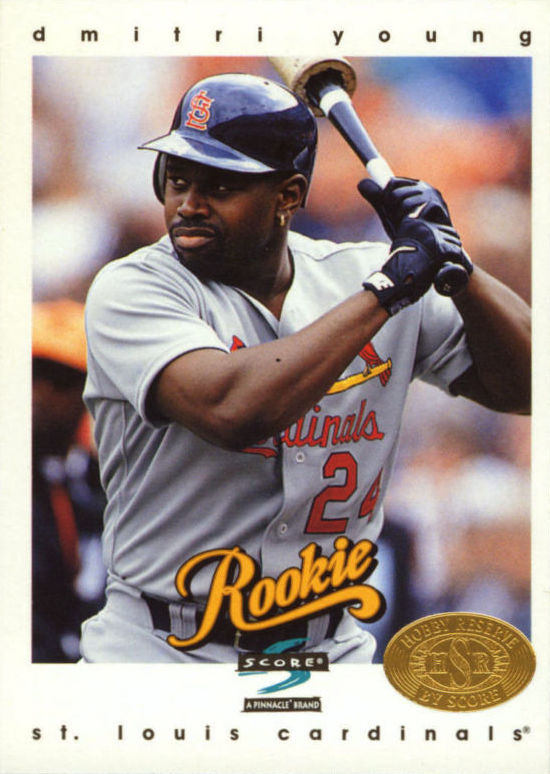 Dmitri Young has decided to resume his pro baseball career ad can not attend the National. The link to the payment site has been removed. As much as I would like to, I just can’t make it out to National this year. I’m sure quite a few of you will be there, so towards the end of the week we will do a preview of what to expect, list some of the must have freebies and events you should try to hit. There is one event that is limited and could easily sell out, so it is best not to wait. Over at the ever-expanding Cardboard Connection there is a listing for a special evening. Recently the site acquired Card Corner Club Radio and is now Cardboard Connection Radio. The show is hosted by Doug Cataldo, Rob Bertrand, (you’ve seen his comments here on the blog as VOTC) Russ Cohen and two-time MLB All-Star Dmitri Young, who played for the Cardinals and Reds but most notably for the Tigers and Nationals. If you didn’t see Young play, you’ve probably seen or heard of his baseball card collection. Featured on the MLB and Topps documentary “Cardboard Treasures”, which we told you about a few months ago, Young’s collection is made up of a variety of Gem Mint 10 rookie cards that include Roberto Clemente, Reggie Jackson, Jackie Robinson and many others. So Dmitri played in the Majors and collects cards. Sounds like the kind of guy you would want to sit down with and have a meal, right? Well you can do that. In what is sure to be a great event with very limited seating, Dmitri Young will be spending the evening sharing a meal and conversation at Harry Caray’s, a restaurant in Rosemont, Ill. near to the National. The event will take place on Thursday, August 4th. Everyone who attends gets to have a photo op with Dmitri, have one of your items that you bring to the dinner signed and get an additional autographed item as part of the package. You’ll also get a goodie bag at the door with items provided by ISA Grading, Leaf, Panini, Topps and Tristar. On top of that there will be door prizes and a silent auction that include, among other things, a game-worn Dmitri Young jersey. Something tells me this is going to be different than your normal “Private Signings” event. This is a group of guys that have worked together already, so I have a feeling the vibe will be a little less formal. I could be wrong about that, but I think the lines will blur a little which should make this a night to remember. If I were going, this would be a no-brainer for me. Wish I could be there.